YMMV: Your Mileage May Vary: "Did IQs just drop sharply while I was away?" In the past few months I've partaken in several discussions on Ridley Scott's career decline and the possibility of redemption Prometheus represented – quite appropriately, metaphorically speaking – for his directorial reputation. Certainly all the elements seemed to be there: a return to a beloved universe of his own creation, a cast of some of the most brilliant actors working in film today, and a viral campaign to re-infect even the most immune of the old fan base. Tragically, the whole amounts to significantly less than the sum of its parts, and I would rather spend an eternity chained to a cliff whilst eagles daily devour my liver than sit through his bloated wreck of a might-have-been-masterpiece again. Obviously I hyperbolize, but it's no more than this self-proclaimed titan of a film deserves. The true tragedy is the amount of potential evident in every mishandled moment; beyond the aforementioned elements of promise, there is enough quality footage on display that any half-decent creative team could have made something twice as coherent, three times as watchable, and – most importantly – half as long. Because, sweet Jesus, does Prometheus feel long despite its modest 124 minute running time, the pain of which could have been greatly alleviated by removal of virtually all expository scenes. As it stands, the Prometheus now playing in cinemas should never have left the editing room floor, and frankly I'm not sure whether to blame editor Pietro Scalia, Scott himself, or the two of them in unholy collusion. But getting back to those expository scenes, they are some of the most intellectually insulting I've ever been subjected to in scifi, and god is that saying something. Not only do they fail in forty five minutes to convey any more useful information than even the most maladroit member of the viewing public could have gleaned in four minutes from any of the already overlong film trailers, but they stumble about that redundant task in the most ham-fistedly reprobate manner possible. Somewhere between 1979 and 2012, Scott apparently converted from a position of cautiously skeptical humanism in the face of a dark and overwhelming cosmos to, of all things, a blatant evangelism for vague Mulderian religiosity and, believe it or not, Intelligent Design. Yes, you heard right, folks: the man who brought us the most abject realism in scifi horror history with a creature terrifying precisely for its unmatched evolutionary sexual adaptability has now released a two-hour polemic on the Search for the Great Questions of Life That Everyone Must Secretly Want to Ask Our Creator(s). Not that the ID crowd is likely to be pleased to see the Answer portrayed as something as insipid as "humanity originated as a result of failed bioweapon experimentation by a race of giant blue...humans (but bald!)" and now look, I've gone and spoiled something revealed in the first two minutes of the film yet that we are supposed to regard as mysterious for the ensuing 122 minutes of "revelatory" exploration. The screenplay is as every bit as stupid as its it seems to think its audience is, and god bless the cast for trying so damn hard to make the most out of every. awful. line. they are expected to choke out with a straight face and good conscience. Fassbender as the Symbolically Named android David steals the show with his O'Toole-inspired performance, and Noomi Rapace does an admirable job trying to fulfill the ersatz-Ripley expectations saddled upon her by the miserable script, but neither they nor anyone else are up to the task of saving a ship as lost as Prometheus' direction. Charlize Theron is uncharacteristically awkward in her ordinarily apt role as the resident ice queen, no doubt struggling to find the slightest element of believability in her character's forced Elektra complexes. And I won't even bother to guess what Scott was thinking when he put Guy Pierce in the least-convincing old man suit this side of a theatre freshman makeup class. But I digress. Unlike Avatar, a big dumb summer blockbuster that also took itself far too seriously yet still managed to entertain, Prometheus cannot fall back on gorgeous CGI spectacle or breathtaking world-building to carry the day. The planet – or moon? – in question is grey, cratered, and, like the too-shiny CG creatures eventually on display, nowhere near as tactile or convincing as its iteration in Alien. Gone is the iconic used-future aesthetic of the Nostromo, replaced by a generic Trekkian interior (think DS9) complete with requisite holodeck and cocktail bar, made frightening only for a few brief seconds of invasion in the final moments of the film's meandering. As for the alien temple/ship whose cavernous corridors never even come into play, there is little to be said of its over-lit passages save that they hold not even a candle's flame to the perturbing otherness of their predecessor. It hardly helps that the camera crew seems to have nothing more interesting to do than to sit back and stare through static, IMAX-friendly frames with all the visual ingenuity of a C-SPAN recording. Surely, one might ask, Prometheus could still in some way be worthy of its horror legacy if it were at least horrifying, even a little? No such luck, my friends. 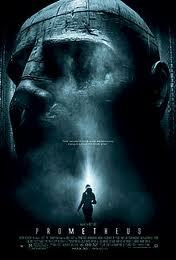 Prometheus is about as scary as a Scientology lecture and only half as well plotted. Where Alien was all slowly-mounting tension climaxed with psychosexual revulsion and sheer nightmare survival instinct, Prometheus is an exercise in the worst kind of Syfy Channel tedium, lacking even in the cheap "gotchas!" that give those campy creature flicks some reason to exist. Even the inevitable appearance of the xenomorph itself is a total letdown, forced as it is by some misguided attempt at continuity-bridging that, with a stinging slap to the face of every fan, still somehow manages to break continuity in the most egregious way imaginable. As with all else in this wreck I blame Scott's ever-mounting incompetence with age. Harsh, perhaps, but if his growing slew of less-than-palatable mass-market garbage over the past decade is not enough to make everyone wonder whether he isn't completely out of creative ideas, then I don't know what is. How many more Hannibals will it take before we stop letting him near beloved thriller franchises? Prometheus, sad to say, deserves not even that sequel's sad legacy. Grade: D+ for fans, C for general audiences. Mixed feelings on that one. I haven't seen it since its release, so I'll reserve judgment on that moment in Ridley's career until I've had time to reassess it. I'm afraid you'll have to elaborate a bit for me on that one, sir. Which part of Hannibal, exactly, is misunderstood?